It's an almost counterintuitive question: Can the physically disabled become artists? The answer depends, to a certain extent, on how one defines art. As the expression of one's personal interpretation of the world around him, art can be created by just about anyone. And, after all, if Beethoven could produce musical masterpieces without hearing them, surely the visually impaired staff of Beijing One Plus One Cultural Exchange Center can become photographers. And so they did. One Plus One, an organization run by people with disabilities that aims to provide media outlets and support for the disabled, teamed up in May with the international group PhotoVoice to train eight of its staff to use photography as a way to communicate their experiences of the world around them. After a week's worth of workshops, during which they learned photography techniques and partook of trust-building activities, participants were unleashed into Beijing – sometimes with a partner and other times alone – to record moments in their lives. The result: Sights Unseen, an exhibit of 16 photos that record everything from lighthearted, everyday debaucheries to windows into more intimate secrets. "We think this project is a very good way to communicate between blind people and normal people," said Sun He, One Plus One's marketing and public events coordinator. "We hope this project will influence more people in China, and also help the visually impaired build more confidence and communicate with outsiders more." In one of the workshops, staff members discussed the things they wanted to show people about their lives. They also learned how to express their feelings and the visions in their minds. Only two are completely blind, but the workshops trained all of them to rely only on their other senses to take pictures. Sun Zhiyuan, the editor and host of One Plus One's Internet radio program and one of the first two trainees in the program, said he would close his eyes, feel for the location and distance of his subject, and snap the picture while holding the camera to his forehead. For more distant subjects that were out of reach, a partner would snap his fingers to guide Sun in the right direction. 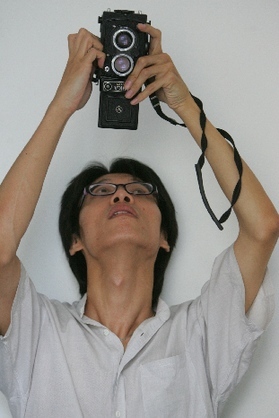 Sun Zhiyuan, a host and editor for One Plus One's radio program, takes a self-portrait. "We all had to put a cover over the screen" of their cameras, Sun said. "Because even us with low vision like to look and see, 'How is it?'" After they had taken their pictures, two professional photographers were on hand to offer advice on which shots were better from an artistic viewpoint. But technical merit took a backseat to what the trainees wanted to capture. "This exhibit isn't necessarily 'art,'" Sun Ke said. "We don't think the photos should be judged on how good they are. What was most important is what they wanted to express." Tactile diagrams, a new technology that is available only in Hong Kong, allowed the trainees to "see" their pictures. A special machine would print a copy of their pictures with raised lines and patterns where ink was heaviest or darkest in the original photograph. Using the tactile diagrams, the trainees could decide whether they had gotten the shot they wanted. The photos in the exhibit were chosen based on what they felt came closest to their intended message. Most of the photos in the exhibit were captured accidentally. Often, the end result turned out differently than what the photographers expected, but the pictures also carry a lot more meaning, they say. 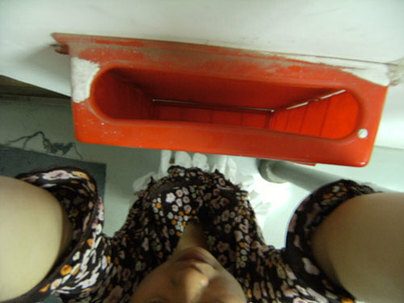 One photographer, Jin Ling, an administrative assistant, said she was curious about the inside of a mailbox, which was too high for her to peer into. So, she used her camera to take a picture. The picture on display shows not only the inside of the mailbox, but also a little bit of Jin herself. "I used my camera to see what I can't see," Jin said. "I didn't mean to include myself in the picture, But I learned that there are a range of things the camera takes a picture of, not just a narrow subject." One of Jin's entries is a photograph of the inside of a mailbox, which was too high for her to see. "If I change my perspective, maybe there will be a surprise," she wrote in her description. 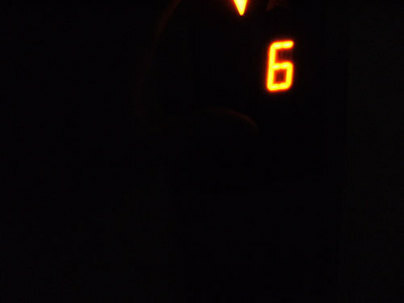 Sun Zhiyuan thought his photo of a bright red "6" would be in the middle of an indecipherable darkness, but it landed in the top right corner instead. "The number itself doesn't mean anything," Sun said. "The bright light and the darkness around it represent my world, how I see. Only after I took the picture did I feel that it represented the uncertainty about my future." Sun worries that his vision will become worse and that one day he will be completely blind. This photograph came out differently than what Sun Zhiyuan had imagined. But he realized it showed an added layer of the uncertainty he feels about his vision and future. The newly trained photographers now hope they can push their project further. The workshops also taught them how to become trainers themselves, and they hope to use their knowledge to work with the local government and blind schools to help other visually impaired people learn this counterintuitive way to express their visions. At the same time, they hope that using this new language to communicate will empower them and other people with disabilities. "We found more things we can do," Jin said. "We may not do it very well, but we can show our potential and vision." "It's the feeling that maybe you're doing something. You're hearing others do it and thinking, ‘Oh, I can take pictures, too!'" 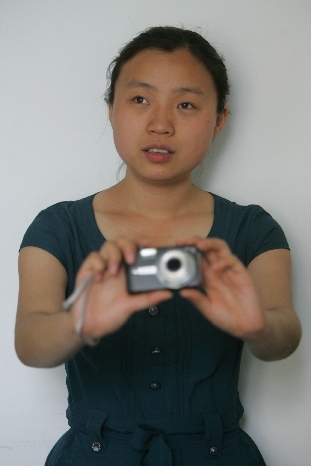 Jin Ling, an administrative assistant for One Plus One, takes a self-portrait.